I hope everyone enjoyed the shortened week with the long Bank holiday last weekend. With the First Friday of the month tomorrow it’s going to be NFP time. 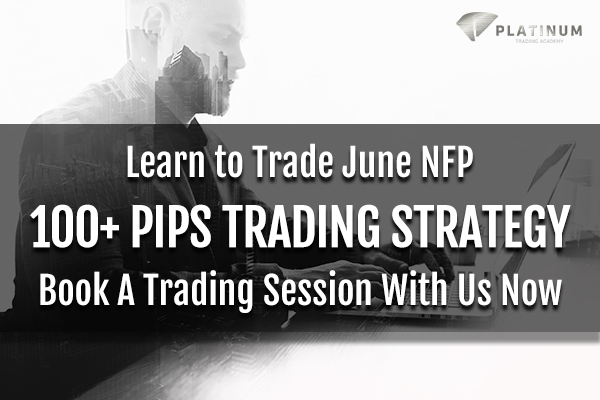 With a busy schedule in June with key trading events including FOMC, Federal funds rate, CPI y/y Platinum members are looking to take some serious Pips. We ran a live event last month which saw member and attendees generated over 100+ Pips on the event. This month, however, we wanted to go one step further and invite you to a private session with a trader to learn how to trade this monthly critical event. Job creation is an important leading indicator of consumer spending, which in turn accounts for a majority of overall economic activity. Typically, Platinum Traders will aim for 150 pips trading this event, so it certainly gets your month off to a great start when traded correctly. According to the report released in May, for the month of April, the Non-Farm Employment Change produced lower figures than expected, and that didn’t materially change expectations for the Economy. The April report came out at 164K, against a forecast of 190K. Fundamental is a big part of currency trading, and Sentiment is built on currency market trends. The last NFP report was a weak one, but the fact is that both the Economy and Labour Market are in good shape. However, the NFP report to-be-released tomorrow will have great significance due to the recent USD bulls in the market and how volatile the market has reacted to the buying up of the USD. The expected number for April in the NFP report to be released this Friday is 190K. The deviation figure to trade the Non-Farm Payroll is +30/-30. If the actual number on NFP is above 220K, compared to the estimated 190K, sell the EUR/USD with 25 pips stop loss. If the actual number on NFP is below 160K, compared to the estimated 190K, buy the EUR/USD with 25 pips stop loss. If the NFP number is above 220K, buy the USD/JPY with 25 pips stop loss. If NFP number is below 160K, sell the USD/JPY with 25 pips stop loss.